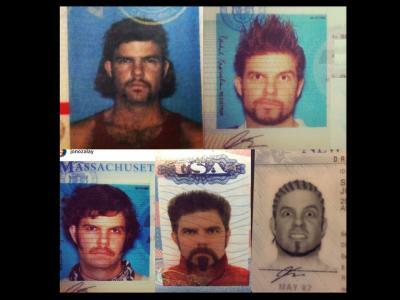 It’s as common a rule as you will find in photography. The rule of thirds is likely one of the first things you learn as a photographer and is one of the most impactful tools you can use to improve your compositions. The rule of thirds does many things for a photograph, enhancing balance and creating interest among them. But rather than blindly adhering to the rule, let’s get into why the rule of thirds works and explore when breaking the rule is beneficial. 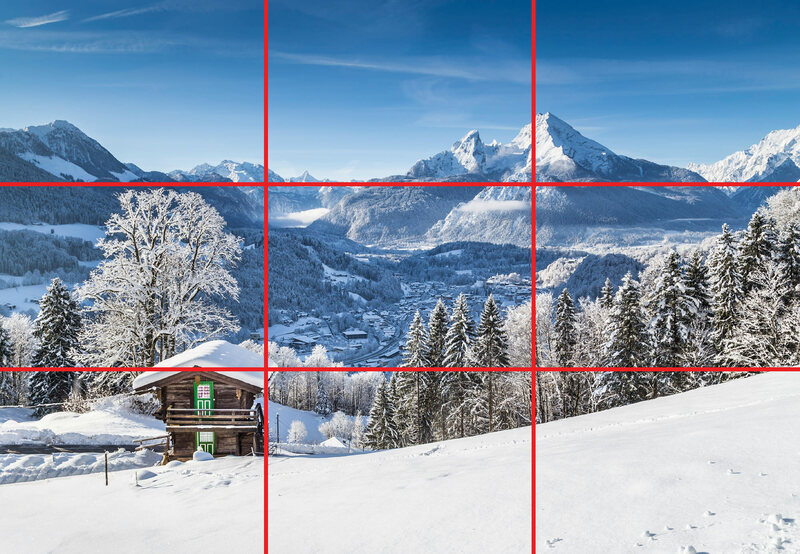 The idea is that you place the most important elements of the image, in this case, the cabin in the foreground and the mountain peak in the background, near one of the lines or at one of the four intersecting points of the grid. Doing so creates a strong counterpoint in an image. Essentially, a counterpoint is an element that provides balance to the primary subject by being diagonally opposite to it. So, where the cabin in the image above is placed at the bottom, left, the mountain peak is placed at the top, right, bringing greater balance to the shot. The idea, of course, is that by placing elements along the grid, you enable the viewer to more deeply interact with the image. This is because if the subject is placed in the middle of the frame, it’s equidistant from all sides and seems quite static. Just imagine how boring the image above would be if the cabin were smack in the middle of the shot! 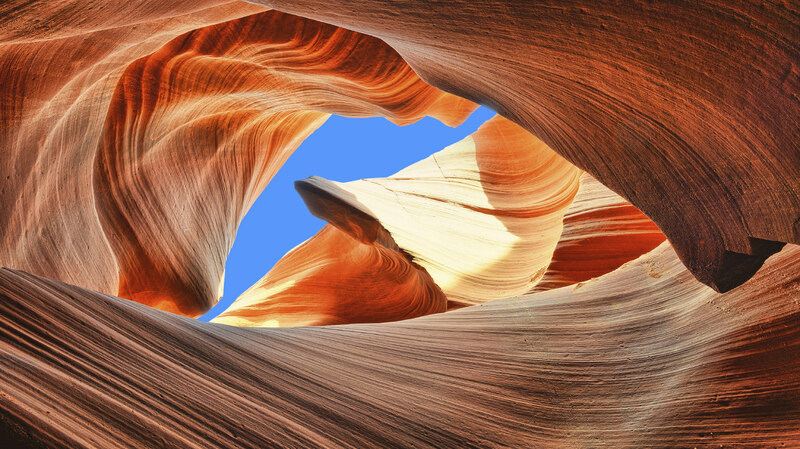 Instead, shifting the primary subject to one side or the other immediately gives the image a greater feeling of dimension because your eyes spend slightly more time finding the subject and investigating how it relates to its surroundings. 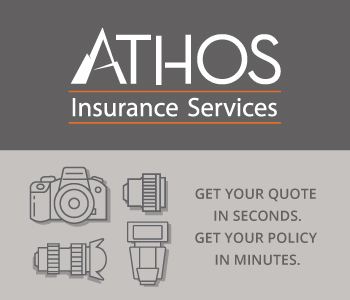 Notice as well in the image above that by aligning the focal points of the image along the rule of thirds grid that areas of negative space are also accentuated. In the foreground, the snowfield to the right of the cabin is opened up. In the background, the sky to the left of the most prominent mountain peaks is opened up as well. This use of negative space gives the focal points more room to breathe – so to speak – and highlights their importance in the frame. As seen above, the rule of thirds allows you to highlight your primary subject, and, if there are many elements of interest in a landscape, helps you make sense of out the chaos. But the rule of thirds also gives you a built-in way to deal more appropriately with horizon lines in landscape shots. For example, in the image below, the horizon bisects the frame, which typically makes for a boring composition. 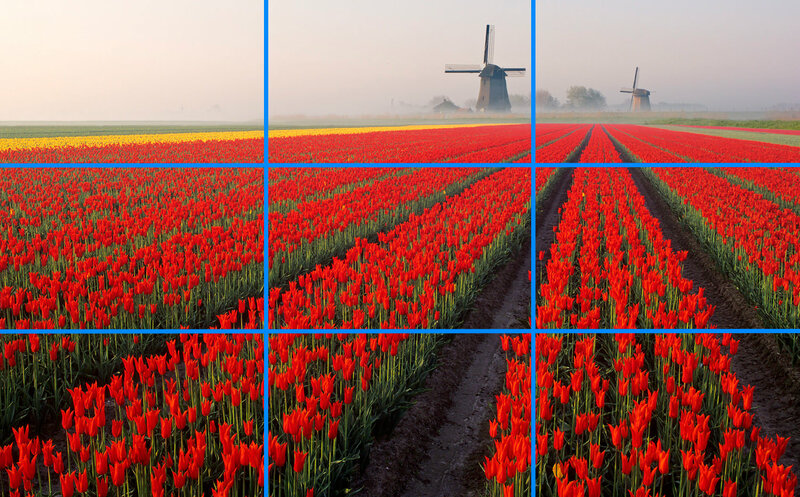 Instead, use the rule of thirds to align the horizon with the upper or lower grid line for a more interesting shot. 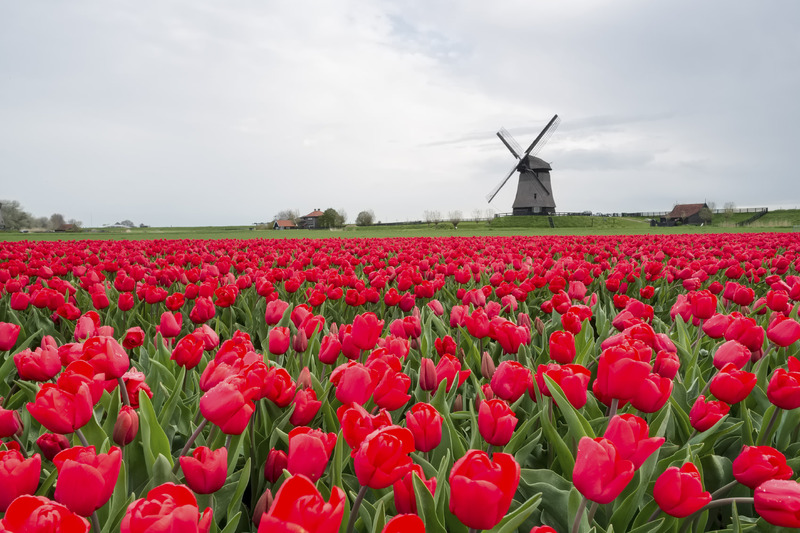 In this case, because the sky is relatively dull due to the fog, shifting the horizon line upward to the upper horizontal grid line allows you to highlight the bright colors and interesting textures of the tulip field. As a result, this image is much more interesting than the one before it. How you apply the rule of thirds to portraits depends in large part on how near or far you are from your subject. 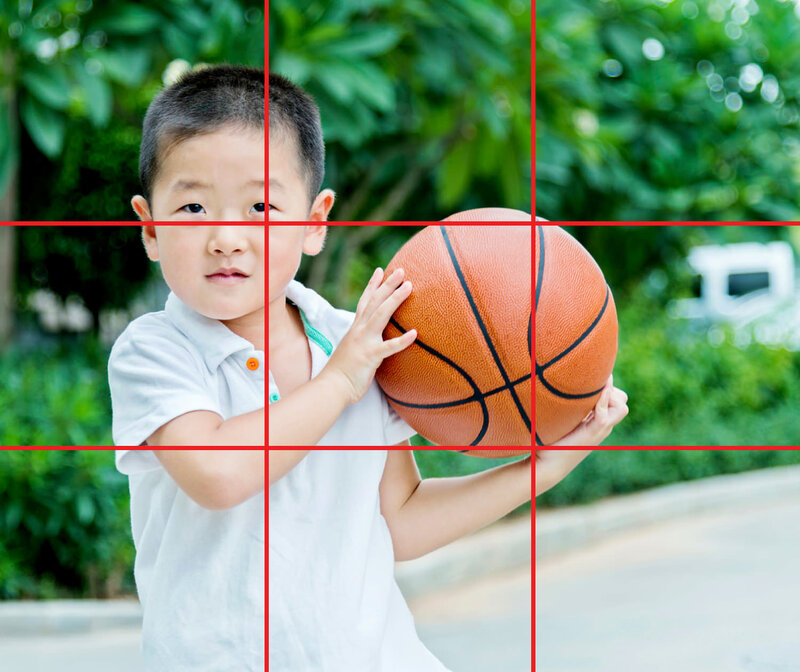 When taking a portrait from afar, you can align the subject’s body with one of the vertical grid lines to help set the scene in which the person is being photographed. In the case above, shifting the gentleman to the right gives viewers a better understanding of his surrounding environment and helps provide context to where he is and what he’s doing. 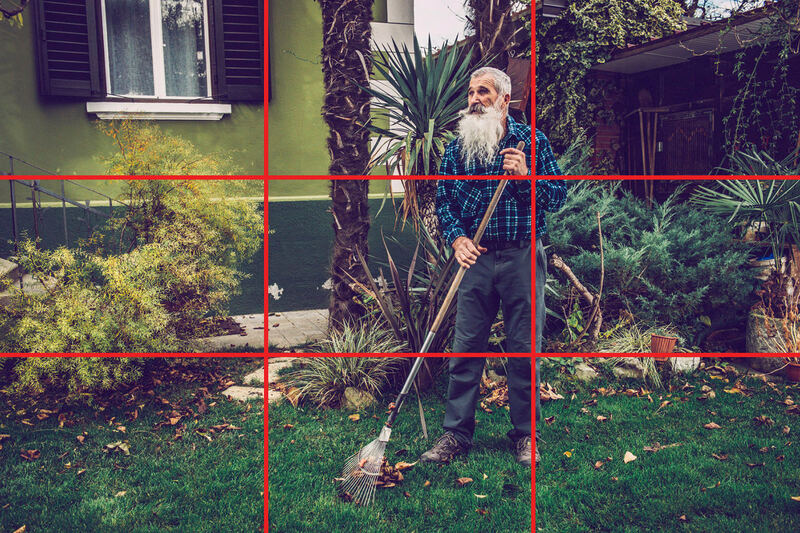 Note that the man doesn’t align perfectly with the vertical grid line – and that’s okay! A portrait of a person from the waist up changes the use of the rule of thirds somewhat. In this case, the eyes become more of a focal point and aligning them with an intersecting point on the grid helps bring our attention to where it’s needed. Note how in the image above, the little boy’s eyes align with the top horizontal grid line, while his left eye falls near an intersecting point. 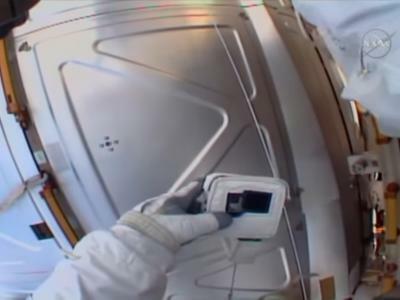 Again, his body has been aligned off-center, giving viewers’ eyes more room to investigate the context in which the photo was taken. Moving in even more for a close-up portrait means the eyes again take center stage. 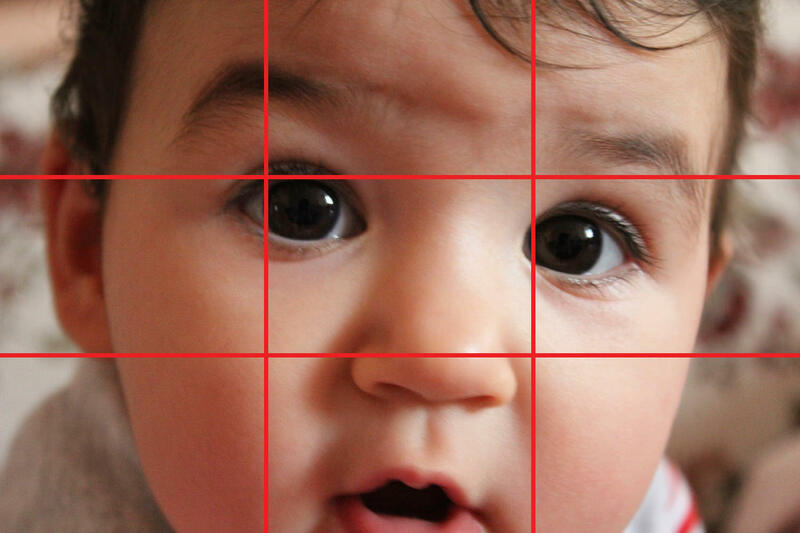 Aligning the eyes near the top horizontal grid lines gives room to highlight the baby’s face. At the same time, aligning the subject’s eyes near the top two intersecting points of the grid gives the portrait excellent balance from left to right. 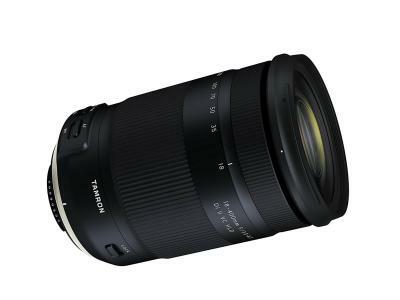 Macro photography similarly benefits from employing the rule of thirds but like with portraits, how you apply the rule will depend a lot on how you are positioned relative to your subject. In this case, since the frog is looking toward the right, composing the image with the frog in the left of the frame, roughly aligned with the left vertical line and upper intersecting line, gives the frog room to look into. Even though the frog is offset in the frame, the image has very nice visual balance. Naturally, if the frog were looking to the left, using the rule of thirds to shift the animal to the right side of the frame would have a similar pleasing effect. But if your subject is looking directly at you, aligning its eyes with the upper intersecting points of the grid has the same impact it did with a human portrait subject. 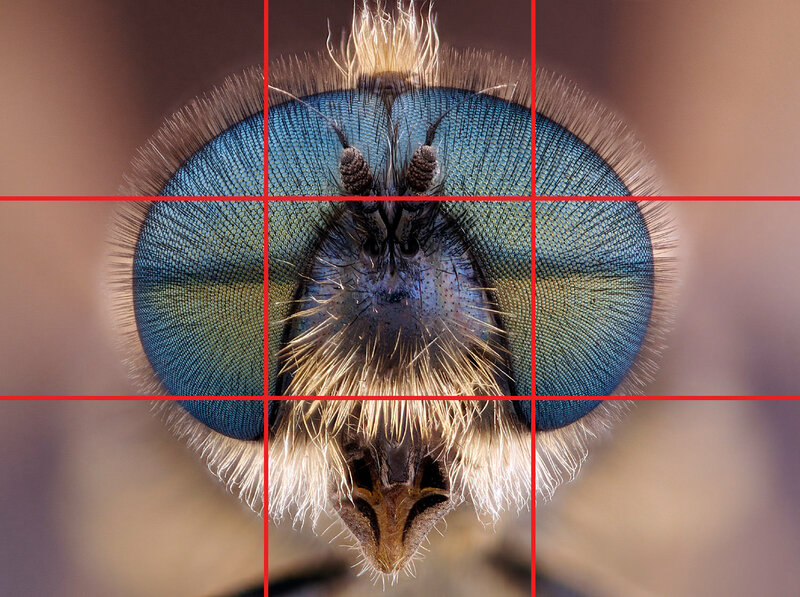 There is very nice balance from left to right, and by placing the fly’s eyes at the upper horizontal grid line, we’re able to see all the intricate details of the fly’s face. Remember that this is art; using the rule of thirds does not have to be perfect. The image above is an excellent example of a photo that is highly engaging and quite stunning, yet there isn’t a single thing about this image that adheres to the rule of thirds. This image is another example of something that’s pleasing to look at yet breaks all the elements of the rule of thirds. The primary subject is in the middle of the frame, and the horizon line bisects the frame as well. There’s nothing that would align with the grid lines, nor is there anything that would align with the intersections of the grid. Yet, it’s a nice image to view. Again, we see that breaking all the rules can still result in strong compositions. 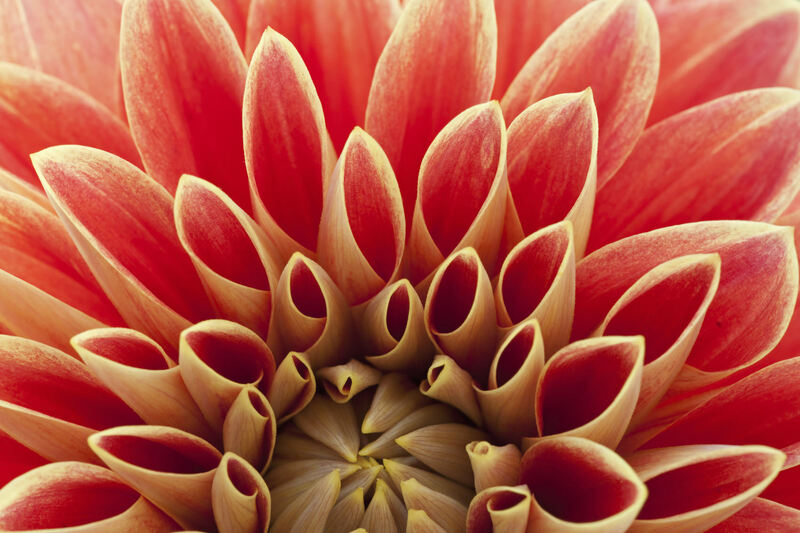 In this macro shot of a flower, the central point of interest is centered at the very bottom of the frame. The radiating pattern of petals wouldn’t adhere to the rule of thirds grid lines, but the image is still quite striking. This is exactly why we refer to the rule of thirds as a “rule of thumb.” It’s highly recommended but doesn’t apply to every situation. Now that you know what the rule of thirds is and how it can benefit your shots, you can go about experimenting with your compositions to see just what you can come up with when you adhere to the rule as well as when you break all the rules. When shooting landscapes, use the rule of thirds to shift the horizon line up or down to fill the frame with the most interesting aspects of the scene. If taking a full body portrait, try aligning your subject with one of the vertical grid lines. Doing so creates nice negative space in the frame that gives more context to the scene. Waist-up portraits benefit from aligning the subject’s eyes with the uppermost horizontal grid line. Doing so ensures there is room in the frame to see the person’s face. 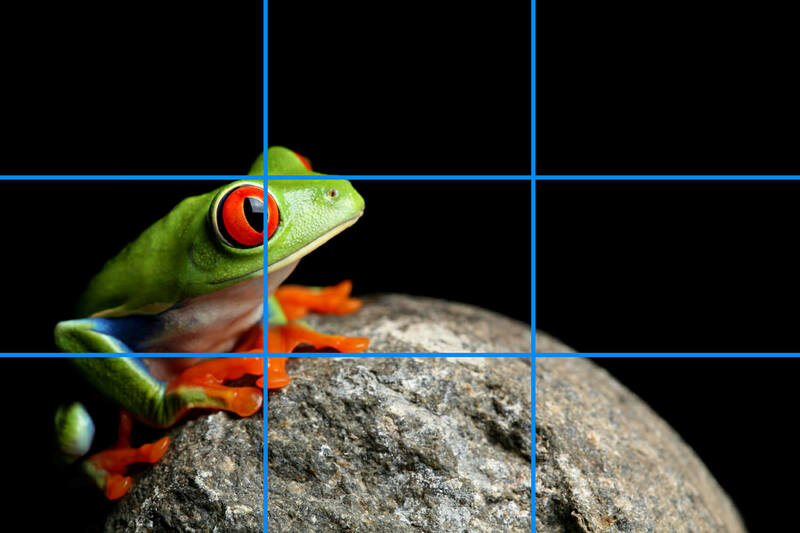 For close-up portraits, align the subject’s eyes with the uppermost intersecting points of the rule of thirds grid. This will help create balance from left to right. When taking macro photos of animals, align them with the vertical grid line opposite of the direction in which they look. So, if an animal is looking to the left, align them with the right vertical grid line. This gives the animal room to look into and allows the viewer to ponder what the animal is looking at. Close-up macro shots of animals benefit from the same composition as close-up portraits of humans. Try aligning the animal’s eyes with the uppermost intersection points of the rule of thirds grid to get great balance in the frame.